Maitland Chiropractic is here to help! Have you been injured in a motor vehicle accident or personal injury? We can help! Slips, falls, we take them all! Whether your visit to our office is the result of a slip or fall, car accident, or simply posture related, Verne Chiropractic is here for you. Automobile accidents can cause a great amount of force and impact to your body. Our bodies are not designed to be able to deal with that much force. Whiplash is a very common neck injury in car accidents. It is caused by the motion of the accident moving your head and neck outside its normal range and straining ligaments, muscles and tendons. The impact from a car accident can damage a disc thereby destroying its ability to cushion the bones of the spine. A damaged disc (such as herniated, bulging or ruptured) may also put pressure directly on nearby nerves, which can cause pain, numbness and weakness in any part of the body that the affected nerve travels to. It is important to treat these type of injuries as soon as possible and prevent the condition from progressing and interfering with your overall health. Dr. Michael Verne specializes in the latest chiropractic techniques to get you back on your feet and out doing the things you love most! We accept insurance and can work with your automobile insurance provider to provide you with the best possible care. Our practice is patient centered, your comfort is our goal. Put the pain medication down! We’re here to help! 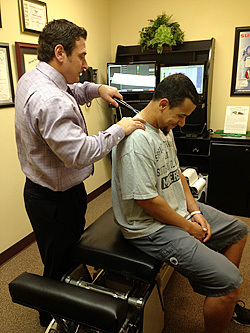 Dr. Michael Verne’s years of experience make him your top choice for a chiropractor in Maitland.